The British automotive industry is best known for premium and sports cars including Aston Martin, Bentley, Caterham Cars, Daimler, Jaguar, Land Rover, Lotus, McLaren, MG, Mini, Morgan and Rolls-Royce. Other car manufacturers with a major presence in the UK include Honda, Nissan, Toyota, Vauxhall, Alexander Dennis, Ford, GMM Luton, Leyland Trucks and London Taxis International. In 2015, the British automotive industry hit a 10 year high by producing nearly 1.6M vehicles, up 3.9% from 2014, and 77.3% of those vehicles were exported. In 2015 the total turnover by vehicle manufacturers in the UK was a record £69.5bn, an increase of 7.3% on 2014. 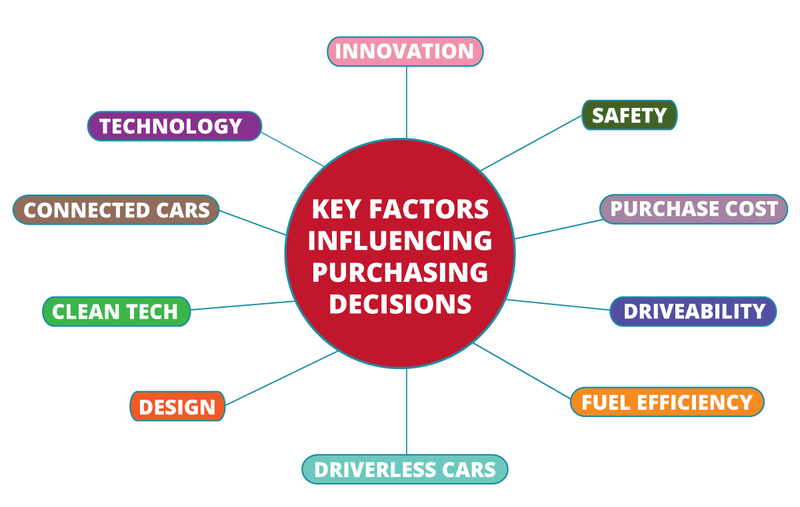 WHAT ARE THE KEY FACTORS THAT INFLUENCE PURCHASING DECISIONS? WHO ARE THE TOP INFLUENCERS AND BRANDS IN THESE AREAS? We extracted over 3.5M tweets from 11th May until 9th August 2016 mentioning each of the above topics and their associated keywords, in addition to mentions of “automotive” and “car”. We then ranked this list based on our Contextual Onalytica Rank of Influence (CORI). This methodology takes into account the 4 Rs of influencer marketing: Resonance (how much engagement they are driving), Relevance (how many times they tweet on topic), Reach (how many followers they have) and Reference (how many twitter lists they appear on). This then provides us with a ranked list of influencers and brands driving the social conversations within each of the topic areas that influence purchasing decisions. The below lists contain the top 10 influencers and brands in each category, please download the full report to see who ranks beyond the top 10! Don’t forget these are just the top 10 in each category, be sure to download the report to get the full list! 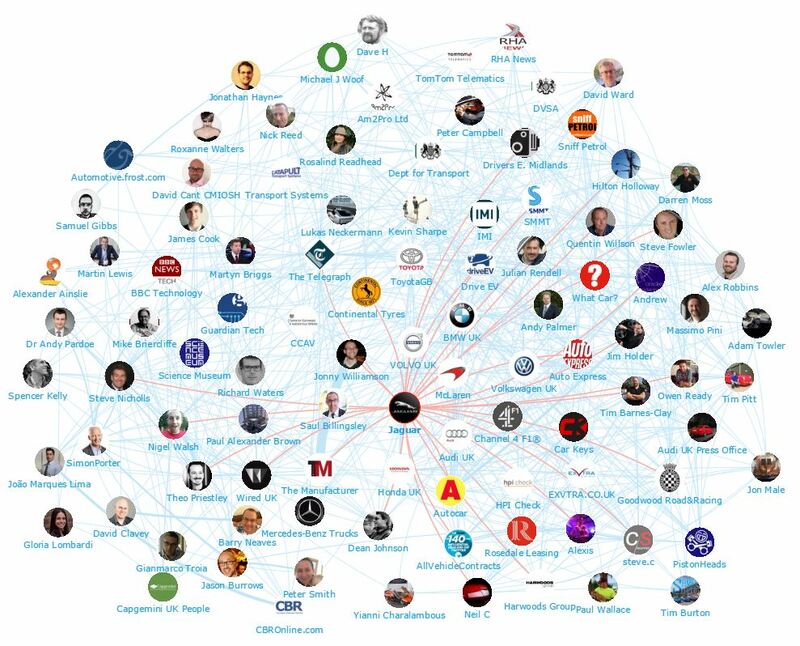 Once we identified the top influencers in the various topic areas in the UK automotive industry, we wanted to create a visual representation of this community to help illustrate the social landscape. The below map shows the brand Jaguar at the centre who were the #3 brand for innovation, #1 for safety, #2 for technology, #4 for driverless cars, #2 for drivability and #2 for design. This map was created with our Influencer Relationship Management software (IRM). Feel free to click on the map to open up a larger version. 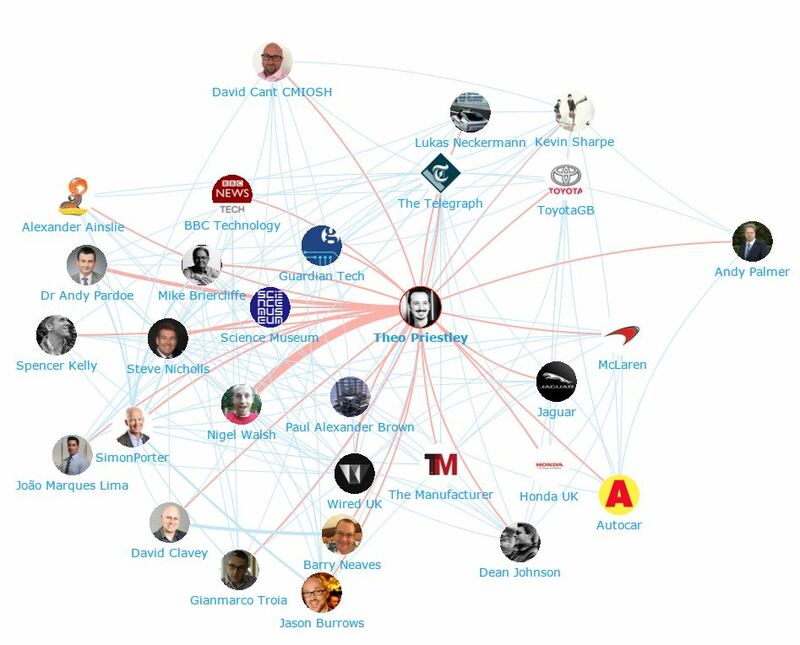 Below you can see another network map created using our Influencer Relationship Management software (IRM) showing Theo Priestley, the #2 influencer for Innovation and #4 for Technology at the centre. If you’re interested in identifying and mapping your community, click here to get in touch! Disclaimer: As ever with these lists, it must be stressed that the ranking is by no means a definitive measurement of influence, as there is no such thing. 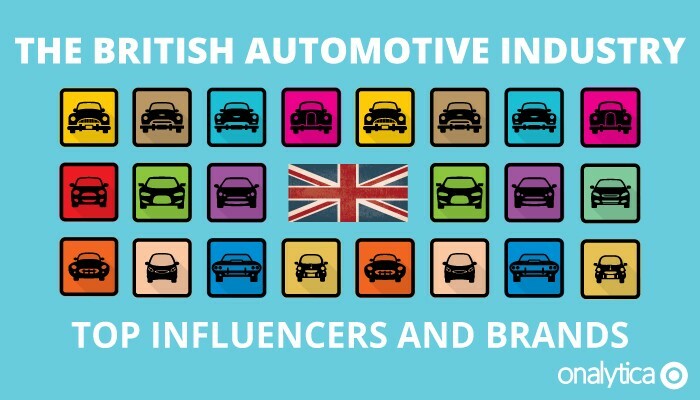 The brands and individuals listed are undoubtedly influential when it comes to driving discussion in the British automotive industry.